ZuPreem® FruitBlend™ Flavor Premium Bird Food is formulated to meet all the accepted nutrient requirements for the maintenance of various types of adult psittacines (hookbills) and passerines (softbills). The diets are nutritionally balanced and require no supplements. 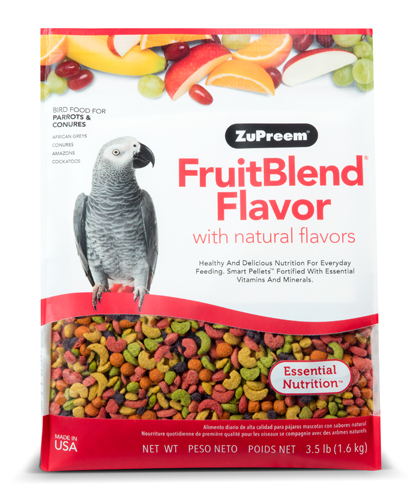 FruitBlend™ Flavor contains differently colored, fruit-flavored extruded nuggets to add variety to a bird’s diet. The nugget shapes are apples, bananas, oranges, grapes and melons, where nugget size allows. In sizes for L (large parrots), ML (medium to large parrots), M (medium parrots) , S (small parrots), and XS (very small softbills) birds.